Nuclear Throne is a game that doesn’t mess around instead choosing to cut right to the chase. It’s no-nonsense approach to throwing you right into the heart of the action – action that rarely gives you a moment to rest I might add – results in a roguelike that not only leaves a great first impression but also manages to maintain that exciting, edge-of-your-seat feeling even a hundred runs deep. Even the story (if you can call it that) just gets straight to the point. You play as a mutant, your aim being to claim the Nuclear Throne and… well, that’s pretty much all there is to it. After a very brief tutorial – one that covers the absolute basics of movement and shooting – you’re out into the wastelands shooting and swinging your way through a series of randomly generated levels each filled with enemies aplenty. Nuclear Throne is essentially a twin-stick shooter played from a top-down perspective all wrapped in a roguelike skin. You’ll spend your time in each level running around searching for better weapons, extra ammo, rads (more of that in a moment) and killing anything in sight. Not until you’ve done the latter task will you be granted access to the next randomly generated stage via a spawning black hole where you’ll then repeat this same process again and again. Everything feels extremely sharp and snappy whether it’s the movement of your character, the aiming, and shooting or even just the length of the levels themselves. There’s little downtime, the game doing an excellent job at always keeping you on your toes. Clearing out everything in your path leaves you little time to celebrate before getting thrown into the next battlefield. While you’ll only start out with two mutants to play as, you eventually expand your crew as you get further through the game, each new addition bringing their own perks and abilities. Take Fish for example who not only starts with and receives more ammo from pick-ups than other characters but can also perform a rolling dodge. Melting meanwhile starts with a fraction of the health of everyone else (in fact so little nearly everything will kill you in a single hit) but also receives more rads (experience) resulting in faster leveling up. Of course, you’ll find your favorites but experimenting with each not only proves great fun but also could open your eyes to a new ability that works even better for you. In fact, I found my go-to character change several times throughout my playtime. It’s this level of variety to choose from that’s a common theme that runs throughout Nuclear Throne and keeps it feeling fresh and exciting with every new run. The weaponry, for example, covers your standard mix of pistols and shotguns but also gets a little more unusual with wrenches for melee attacks, explosives, lasers and even something called a triple machinegun. With room to carry only two weapons, you’ll want to find the best pairing possible for your play style. As you’d expect each offers its own pros and cons – the aforementioned triple machinegun, for example, sprays bullets in multiple directions but eats through your ammo extremely fast – and much like the characters, testing and figuring them out is all part of the fun. I previously mentioned rads, the game’s take on experience that plays a key role in helping you on your journey. Dropping from killed enemies and destroyed canisters, collecting enough will allow you to level up and choose one of four randomized mutations. These then offer an advantage to the player such as lowering the health of enemies, slowing the speed of their projectiles or increasing the amount of ammo you can carry. Unsurprisingly some of these are of more use than others but since leveling is fairly quick out the gate chances I rarely found myself in a run where I didn’t get at least one or two of my preferred choices. 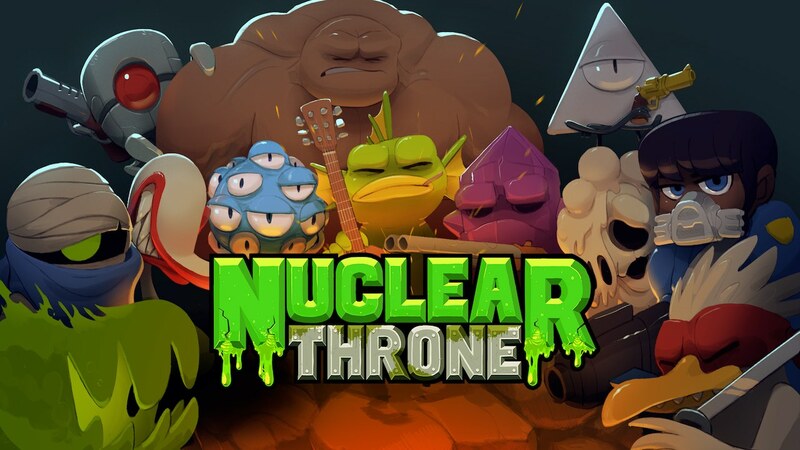 Nuclear Throne like so many other roguelikes out there is not an easy game to beat. Every new level faced introduces tougher enemies in increasingly larger groups and even the occasional boss battle. With ammo always a concern and health pick-ups a rare lifeline in an otherwise nightmare-filled wasteland perfect runs can go to hell in a matter of seconds be it courtesy of a barrage of bullets or even a stray exploding car. Can it get frustrating? I’d be lying if I said I never felt the urge to switch off the console after seeing my latest effort go up in flames but that never stopped me wanting to return and reach that little bit further in my next attempt. Local co-op is also an option with Nuclear Throne and while you might think that having a friend to help would make things a lot easier, which definitely isn’t the case here. Not only do you both have your own ammo count (that means picking up clips or shells will only top up the stock of that person) but resurrecting will cost the helping player half of their health – a rather weighty request especially considering HP isn’t exactly high to begin with. This is certainly a game where you’ll want someone fairly well practiced in twin-stick shooters to even stand a chance of making it through together. The fact you’re sharing the same screen doesn’t help matters and can lead to instances where you lose your mutant in the chaos of all the enemies, bullets and explosions darting around. Suddenly a great run can be ruined in a matter of confusing seconds. Nuclear Throne is an absolute blast whether you’re kicking off your very first handful of runs or attempting your hundredth. The action is intense, the pace rapid and the difficulty tough but rewarding. We may be spoilt for choice when it comes to indie gems but Nuclear Throne is one you shouldn’t pass up on.